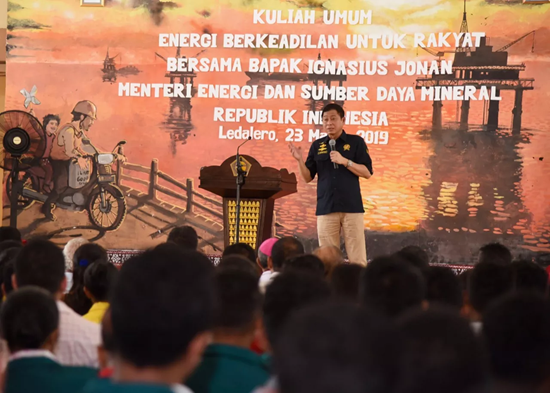 In front of the academic community of the Catholic Philosophy College (STFK) of Ladalero Maumere East Nusa Tenggara (NTT), Minister Jonan explained clearly the meaning and implementation of Fair Energy, especially in the past two years. "Equitable Energy for us is to provide energy evenly to all levels of society to all corners of the country at affordable prices. The President always speaks this is a matter of social justice," explained Jonan at the STFK Ladalero Hall on Saturday (23/3). Jonan also explained some concrete actions that have been carried out in his leadership period, such as allocating the ESDM sector budget by 54% in 2018. "Maybe this is throughout the history of the Ministry of Energy and Mineral Resources, only this time more than 50% is used to build infrastructure that benefits are directly felt for the people, "Jonan said. Some infrastructures that have been built up to 2018 and have a direct impact on the community, including BBM Satu Price built 131 points, connected city gas networks as many as 463,619 Household Connections (SR), 30,000 points Public Street Lighting- Solar Power (PJU-TS) and 2,288 groundwater drill wells capable of serving 6.6 million people. While specifically in 2018, communities in 53 regencies / cities received 25,000 packets of 3Kg LPG kit converters and 175,782 Energy-Saving Solar Lights (LTSHE) in 16 provinces thus increasing the national electrification ratio to 98.3% by the end of 2018. "This is part of the Pre "Electrification through clean energy. People always remember me as a train builder. I also want to be remembered as a father of new renewable energy," said Jonan. What the Government has been doing so far, said Jonan, is based on the 1945 Article 33 of the Constitution. "Whatever is done, Article 33 of the Constitution remains one of the cornerstones. Even the law that has a lex specialist value refers to it," said Jonan. Regarding the management of the ESDM sector, which states that the control of the earth, water and natural resources in it must be controlled by the state, but not necessarily self-managed. According to Jonan, people's prosperity is the estuary of the constitutional mandate. This condition is carried out given the limited human resources that are still minimal in Indonesia in managing the ESDM sector, such as oil and gas and mineral and coal. Nevertheless, Jonan hopes that the younger generation will be able to manage the ESDM sector themselves, which in the past year has been able to contribute more than 50% of national PNBP in the future.